One of those things I've loved discovering is how to use the things I can find in my backyard to decorate my house. It's cheap, easy, and takes no time at all. It just takes a little imagination. When we do yard work, I'm usually grabbing up random stuff to bring inside before Hubby throws it all away. Growing up, my bedroom always had feathers, interesting rocks, and seashells adorning the shelves. Someday I would love to have some rose, gardenia, and peony bushes. Right now we mostly have trees and random non-flowering bushes, and those are a bit out of control. Our overgrown crepe myrtle trees are nice but they only flower for about a week. Since buying flowers at the store can be expensive, I figure out how to use what I have. 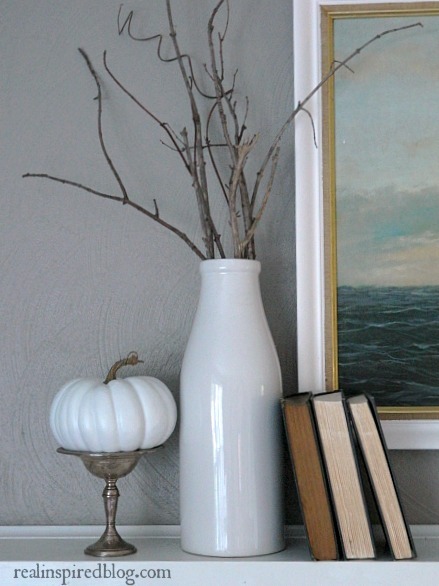 On last year's fall mantel, I placed bare branches in a simple white vase. 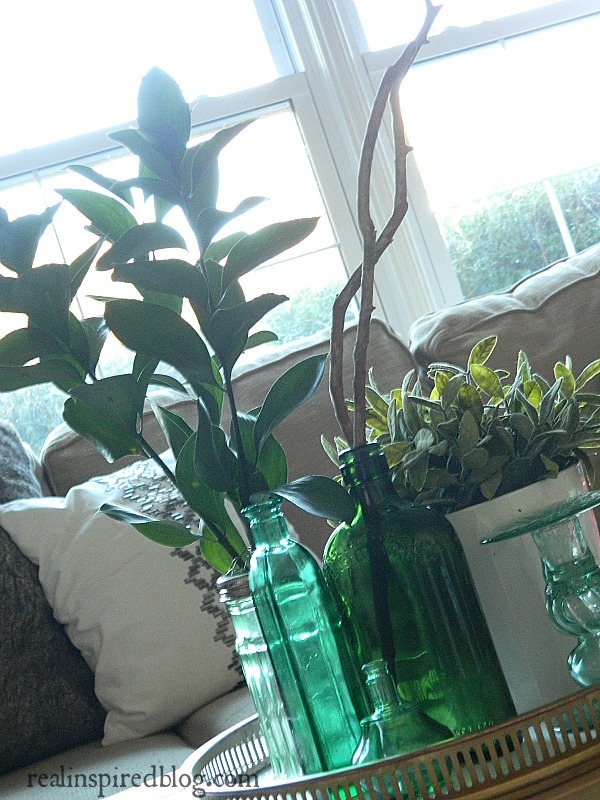 A tall, solid vase can hold bigger branches and the combo makes a big visual impact. 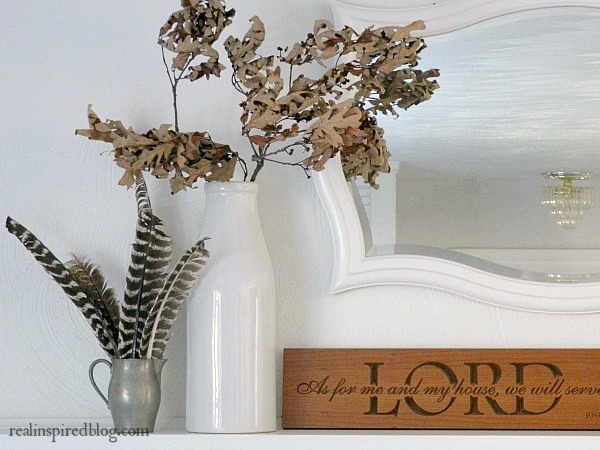 My mantel is long and wide so I use this method to add some vertical height. This would work just as well on a dining room table or dresser. 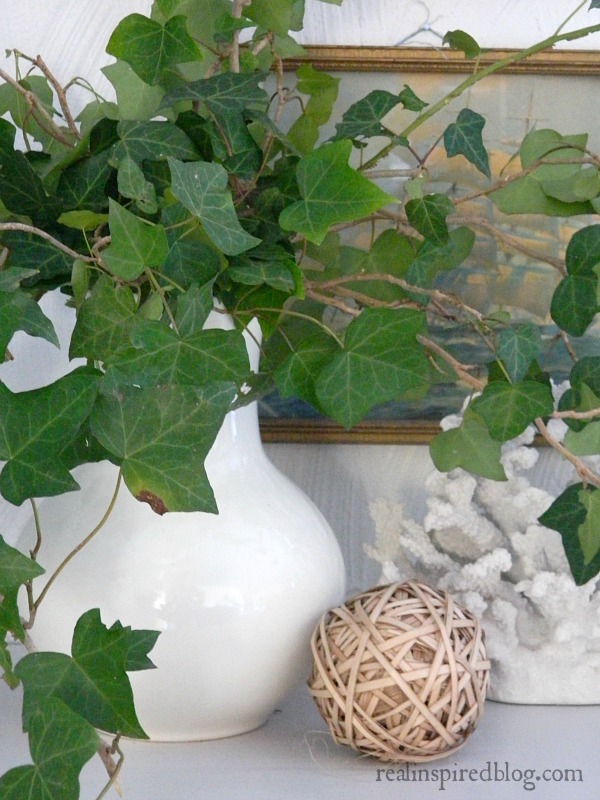 Usually I'm not all about ivy(seriously, the '90s may have ruined ivy for me forever), but several ivy vines in a vase pretties up the dresser in my living room. It has to be cut back anyway. Why not use it? 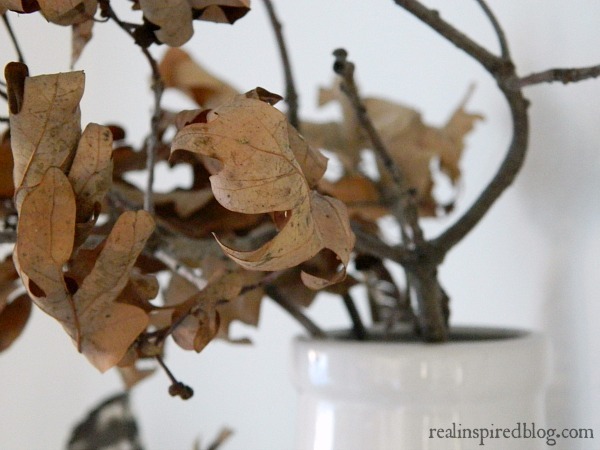 For a simple fall mantel, I found a branch of brown leaves that blew down in the wind. In my favorite vase, of course. 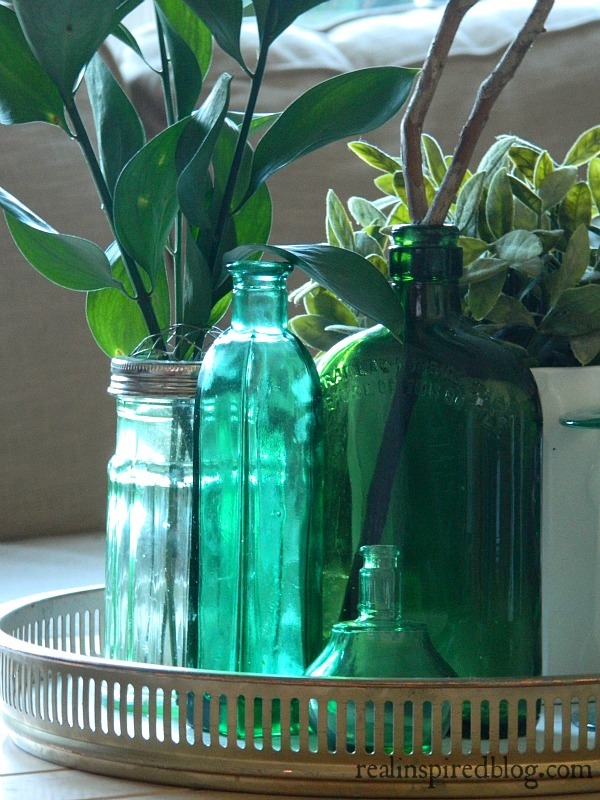 Some leafy stems and an interesting branch in an antique green bottle. I think Little Man found the stick and I happened to think it looked interesting and stuck it in the vase. Clustering things together in a small group adds more visual impact too. From last year's Christmas tour. 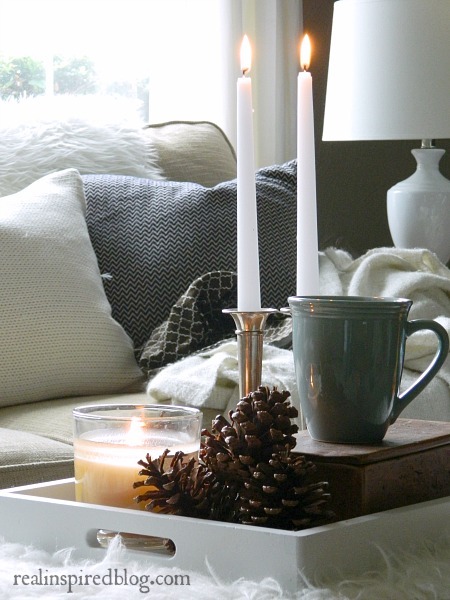 Pinecones are always good in fall and winter decor. As are candles. And coffee. Because that magical elixir of life goes with everything. 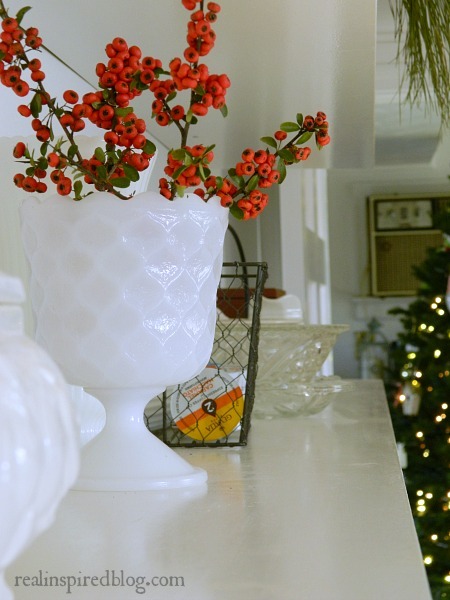 I can't wait to start gathering stuff to decorate with for Christmas! I'm impatiently waiting for some pine boughs to fall from our lone pine tree. It has yielded pinecones in abundance but no branches yet. 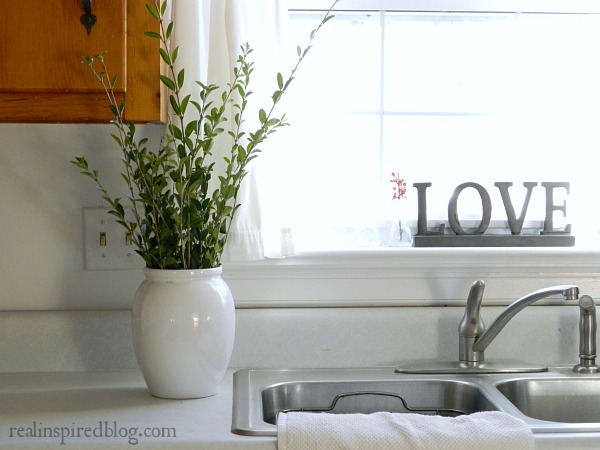 If you are struggling to decorate and everything feels off, try bringing a little of the outdoors inside. Sometimes a touch of the organic can make the difference. Even a bundle of sticks can make an impact. It doesn't have to be perfect. In fact I much prefer it to the fake branches from craft stores. So, now I'm decorating from the back yard. I used to think that I couldn't do it because I didn't have lots of pretty flowers. I never took the time to look at how I could use what I had. Don't make my mistake. I strongly encourage you to look at your yard and think about it in a new way. Don't see your yard as limiting you. It's just an opportunity to get creative. I'd love to hear the beautiful ideas you come with!